What drew you to want to teach at GC? When I came to Goshen College as a student I encountered a remarkable set of mentors — professors who were active in research and publishing in their disciplines, but also deeply committed to teaching and to their Christian faith. I remember thinking in one of my history classes, “this would be the best job in the world!” And it is! What do you love most about teaching GC students? Goshen students are smart, funny, diverse and curious about the world. Many come to Goshen with some sort of international experience. Most are eager to ask questions, think critically and find links between what they are learning in the classroom and the world beyond Goshen College. I learn from them every day. What excites you about history? History is such a wide open field. Even though we are often focused on a very specific era or theme or region, historians can always ask very basic questions about the meaning and purpose in life, the nature of human communities, competing visions of the “good life,” or understandings of transcendence. It brings together the particular and the universal in beautifully complex ways. What do you enjoy doing outside of your academic work? I love to read all kinds of books (mysteries, biographies, texts on brain science, theology/ethics); I run every day. And I enjoy spending time with my wife and our family, which now includes a granddaughter. How does the college’s vision (international, intercultural, interdisciplinary and integrative) connect or shape your teaching and work? 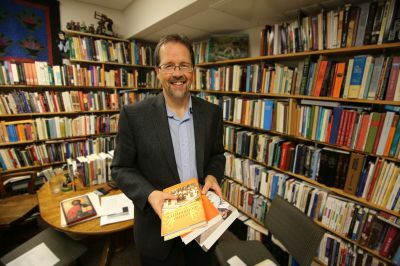 For the past three years I have been working very hard to establish the Institute for the Study of Global Anabaptism (ISGA) — a research program, closely linked to the Mennonite Historical Library, that focuses Goshen’s longstanding tradition of “scholarship for the church” on the phenomenal growth of the global Anabaptist-Mennonite church. I recently offered “Anabaptist History in Paraguay” as a May term course. All of these initiatives are deeply rooted in Goshen College’s vision of international, intercultural, interdisciplinary and integrative pedagogy. How do you strive to make peace through your work and life? Maintaining close relationships with my colleagues and students is a priority for me. This means being attentive to each other as whole people — including the emotional and spiritual aspects of our identity. I want to treat people with dignity and respect, always seeking out perspectives that differ from my own. Gaining a historical perspective on conflicts — understanding the deeper reasons why people or groups behave the way they do — is often the first step toward reconciliation. Is there anything else you would like students to know about you? I am fully committed to Goshen College’s five core values, and I find a great deal of joy in my work. Bring your gifts and questions and perspectives to Goshen, and let’s have fun learning together.